Indepth Look: Will a Recent Lawsuit Leave 3D Printed Guns Easily Accessible? Gun control is already a hotly debated issue in today’s political climate, so you can imagine how contentious the idea of guns which can be independently made by anybody with a 3D printer is. For those unfamiliar with the concept of a 3D printer, it is essentially a device which can take a computer-aided design (CAD) file and fabricate an object from the digital blueprint. The typical 3D printers on the market print in plastic polymers. However, higher-end industrial 3D printers can print in any number of materials—including metals. With such a versatile tool, it was only a matter of time until we started running into legal problems with its use. There have already been a number of cases over 3D printers and the CAD files associated with printing; intellectual property has been one of the big questions for instance. However, it has been the 3D printing of guns that has been causing the most legal hubbub recently as a case starting all the way back in 2013 has hit the news as the courts have seen a flurry of activity. The initial issue arose when Texas native Cody Wilson developed blueprints to allow 3D printers to create a nearly entirely plastic and fully functional gun. He called this plastic gun a suitably ludicrous name, naming it “The Liberator.” The US State Department stepped in and nearly immediately stepped in and ordered him to stop making the CAD files available over the internet. You can see why they did this, there’s several issues with both the ability of anybody to independently create an unregistered firearm with no record of its existence and in the simple fact that the guns in question are nearly entirely plastic–the only metal is the firing pin and a piece of metal intended to make the gun comply with the Undetectable Firearms Act. We’ll discuss this act in more detail later, but suffice it to say that an all plastic gun obviously foils metal detectors with great ease. The State Department’s order to stop, primarily based on the International Traffic in Arms Regulation (ITAR),argued that posting CAD files that can be used to create guns violated arms-export controls as the gun plans could be downloaded to produce them in foreign countries. Wilson and his company Defense Distributed complied and took down his files, a moderately useful measure as we will discuss later, but sued the State Department alleging that their actions violated not his Second Amendment but his First Amendment Rights. Just this last July, the State Department decided the case wasn’t worth pursuing and settled the case and removed the order barring Wilson from posting his CAD files for 3D printing both the “Liberator” and a slew of other CAD files for 3D printed weapons Wilson had made in the meantime including assault rifles and other types of guns. This rapid change of heart on the part of the State Department apparently was partially inspired by the Trump Administration and Jeff Sessions’ Department of Justice. The State Department released a statement saying that the Department of Justice told them they should settle the case as they would apparently lose the First Amendment arguments here. After the settlement, Wilson made a statement that he would be releasing the files online for free download last Wednesday on August 1st. However, the response from other states was immediate once the settlement came down. Originally, eight state attorney generals sued the government to prevent this reversal-arguing that they had not followed proper procedures in changing their approach to firearm exports. This led to Wilson releasing the plans early before the Judge on the case—Judge Robert Lasnik—ruled that the states were likely to succeed and put the temporary injunction back in place to make Wilson take the plans back down and not put them back up for now. The hearing leading to this happened just around a week ago on July 31st, just a day after these original eight attorney generals brought the suit. The 30th of July also saw 20 different state attorney generals write the State Department arguing that the gun plans needed to be stopped. In the last several days the lawsuit has expanded to include 19 states suing to stop distribution of these plans as a policy matter. There will be a hearing determining exactly what will happen going forward this Friday on August the 10th. The attorney generals here moved fast, citing concerns over the threat to public safety. They also argued violations of the state’s 10th Amendment rights, stating that the Trump administration has infringed on the states’ police power by overruling their firearms laws and potentially allowing firearm access to children, felons, and the mentally ill. There is a lot to unpack here in terms of how the lawsuit may shake out going forward, especially in regards to the 10th Amendment claims. However, at a minimum, it is likely that the judge was correct in ruling that the injunction needs to be in place for now based on the fact that the required investigation before repealing a regulation like this was not done. However, this case is far from decided and will certainly see a lot of twists and turns as it develops. 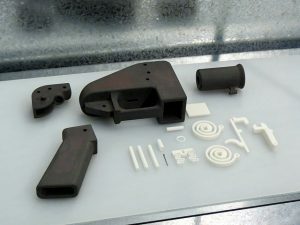 For now, however, we can at least get a grip on some of the general legal concerns around 3D printed guns, the First Amendment arguments surround CAD files and software, the action Congress is taking on the issue, and take a moment for some thoughts about what we may see in the near future on both a practical and a legal level. The two primary legal issues that 3D printed guns run afoul of on a federal level are the Undetectable Firearms act and ITAR. The former makes the guns themselves a problem while the latter, at least as previously argued by the State Department, makes the files themselves used to create the guns an issue. To put it simply, the Undetectable Firearms Act is aimed at making sure nobody brings a gun through an airport metal detector. Under the Act, it is federal offense to manufacture, import, sell, ship, deliver, possess, transfer or receive” a firearm capable of defeating airport metal detection.” In order to not violate the act, a gun needs at least 3.7 ounces of steel in it. The act itself has been renewed by Congress back in 2013. As designed, the “Liberator” doesn’t fall afoul of the act as it requires a metal firing pin and some additional metal inserted inside to meet the requirements of the act. However, that being said, it would very easy to remove the firing pin and not install the additional metal and have a gun you could easily waltz through TSA with. This one of the primary concerns with the widespread distribution of unregistered and untraceable plastic firearms. While the issue with the Undetectable Firearms Act is fairly straightforward, ITAR is a much more complicated beast. The State Department regales exports of defense and military product pursuant to ITAR. ITAR is essentially the State Department’s regulatory scheme for preventing export of military and defense related technologies—a national security measure. However, the exact definition of what is and isn’t a military or defense related technology has expanded a fair bit over the years—going from weapons to cryptography to satellites to software and more. There is a list of goods and services covered by the regulations known as the United States Munitions List which has been changed and expanded over the years. The list is also sometimes requires interpretation to determine whether something is covered—a process which sees review from a number of Federal agencies. The actually activity under ITAR has skyrocketed since 1999 with hundreds of millions in penalties levied against everything from Lockheed to Motorolla. A violation of ITAR occurs when a US person exports covered items to a foreign person without the approval of the US State Department and almost always includes both a money penalty and an injunction requiring certain action to stop what the violating party is doing. Exporting parties are also required to register with the State Department. In Wilson’s case, since the internet is available outside the US the State Department argued he was exporting the software necessary to create guns. They argued, at least before the settlement, that this meant that posting the plans for the 3D guns an export in violation of ITAR. After the settlement they have changed their tune drastically and stated that they would redraft ITAR regulations to allow the publication of files and software allowing the 3D printing of firearms. It is this regulatory change that has led to the lawsuits on the part of the states. Are 3D Printed Guns a First Amendment Issue? We discussed the fact that Wilson has turned not to the Second Amendment but instead to his First Amendment Right to Free Speech in arguing it is unconstitutional to prevent his posting of 3D gun files. He is essentially arguing that his data is speech and that preventing him from sharing that data is a prior restraint of constitutionally protected speech. Prior restraints are where the government creates a law that preemptively stops speech; such laws face strict scrutiny and are generally First Amendment violations. However, the question here is primarily whether his software is speech in the first place. This is something that is, frankly, an undetermined issue of law. The argument here from Wilson is going to compare his software—instructing a 3D printer on how to create guns—to a book on how to make guns or explosives. A book of this sort would certainly receive First Amendment protection and could not be censored. On the other hand, hardware used to make a 3D printed gun would not receive that sort of protection. So the question is whether the CAD files and software instructing the 3D printer to make a gun are more along the lines of a instructional book or are simply part of the functional hardware of the 3D printer for First Amendment purposes. This is an unsettled question. The files certainly are not useful without a 3D printer to interpret and make use of them as an instructional book would be. However, a particularly broad ruling limit First Amendment protections regarding software may have some unintended negative consequences. This issue is one that simply does not have enough information to interpret as is. Regardless of what a court decides on the issue it will be a substantial breakthrough in the contours of constitutional law. The frenzy of legal attention on this has also drawn the attention of Congress. Just last week, Bill Nelson—a Senator (D) out of Florida—introduced a renewed Untraceable Firearms Act and a new 3D Printed Gun Safety Act. The latter would make it illegal to intentionally publish a digital file that makes a 3D printer create a gun. The bills were backed by several other Democrats. Nelson originally asked for the immediate approval of the bill granted by unanimous consent of the Senate. If nobody objects, a bill immediately passed. However, the Republican Senator out of Utah—Mike Lee—objected citing the First Amendment arguments that Wilson has brought forth in his lawsuit. It is unclear where these bills will go at the moment. President Trump has also weighed in on the issue somewhat, saying that he spoke to the NRA on 3D printed guns and the issue “doesn’t seem to make much sense.” It’s not entirely clear what part doesn’t make sense or the President’s position on the issue at the moment. What are We Likely To See Going Forward? Perhaps the simplest issue with Wilson’s case going forward is that you can’t really take something off the internet. Wilson may not be distributing his plans but others already downloaded them and have made it clear that they will be distributing them as widely as possible. Now that they are out there, stopping Wilson is a stop gap measure without a law such as the 3D Printed Gun Safety Act to make the production of such weapons a crime. 3D printed guns present the possibility of unregistered, hard to detect, homemade guns with no serial number that are easier to dispose of than a standard gun and available with no background check or limitations. Even still, there is question of regulation versus an outright ban. 3D printed guns are far from the most common way of obtaining an unregistered firearm, although they certainly have the potential to add to the problem. Obtaining a 3D printer and the materials to make a 3D printed gun is a challenge. It is likely 3D printing isn’t even the easiest way to make a firearm at home now. It is also possible to obtain a gun off the black market or simply steal one—both still likely easier options at this point than 3D printing. This being said, this case and these laws are a chance to get out ahead of the technology as opposed to struggling to keep up from a legal standpoint—an all too common state of affairs. We’ll see later this week what happens with Wilson’s hearing. While that ruling may be an indication of what’s to come, this is an issue that may well be appealed all the way to the Supreme Court. « Was It Legal For Michael Cohen to Tape Donald Trump?